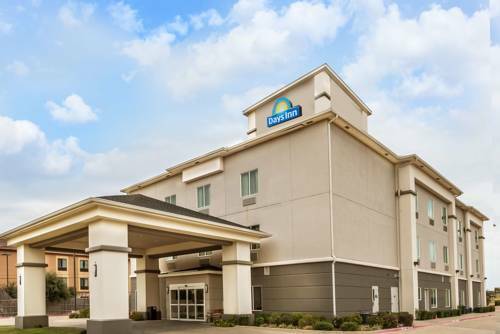 Our Days Inn and Suites Mineral Wells hotel near Possum Kingdom Lake and Lake Mineral Wells State Park is just inside the entrance of Fort Wolters Industrial Park, an hour from Fort Worth, 15 minutes west of Weatherford and 20 minutes south of Jacksboro. For adventuresome guests, the nearby Brazos River offers a wealth of recreational activities, including kayaking, canoeing, boating and fishing. A variety of shopping and antiquing opportunities along with a wide variety of restaurants can be found in the surrounding area. Relax on your pillow-top mattress in front of your flat-screen television. In the morning, give yourself a boost with free Daybreak continental breakfast with hot items. Our fitness center, which is open 24 hours, is the perfect spot to start or end your day. Go for an afternoon swim in our outdoor pool, or check your email with free high speed Wi-Fi Internet access. Enjoy our barbeque patio and 24 hour business center. Our hotel in Mineral Wells, TX, offers guest laundry service and a microwave and refrigerator in every room. For your health we are a smoke and pet free hotel. ~33 miles from Mineral Wells. A small museum that not only refutes the "theory" of evolution but proves that Man and Dinosaur walked the earth at the same time. ~43 miles from Mineral Wells. ~53 miles from Mineral Wells. Plain cedar benches became the center of controversy in 1949 when the ladies of Whitney, offended by bench-loads of cussing, spitting, whittling men, demanded that they be moved to an alley. Refurbished benches are outside the museum, which exhibits the Life magazine story on the ultimate victor. ~73 miles from Mineral Wells.